At Altus Dental Pediatric Surgery Center, we’re committed to providing family-friendly dental services tailored to your child’s unique health as well as your family’s financial needs. Our board-certified pediatric dentists are up-to-date on the latest treatments and procedures and always have your child’s best interest at heart. You are also fully protected from unexpected costs and bills under our Guaranteed Patient Satisfaction program. As a part of Altus Dental, the Pediatric Surgery Center offers the same quality of service. We know you might need help during this important decision-making process, and we want you to feel confident with your choice. That is how we are different from the rest. Unlike other dental surgeons, our pediatric specialists are certified by the American Academy of Pediatric Dentistry and will also hold a consultation in the actual surgery center, making sure you and your child are completely at ease in our facility. Above all, your child’s comfort is our number one concern, so our specialized team will listen to your needs and translate that into the best possible care. 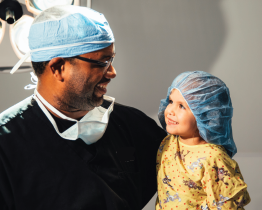 We also encourage you to participate further in the process by greeting your child in the post-anesthesia area after surgery. In our commitment to ensuring your child’s safety throughout the entire procedure, our medical team and dental team work in tandem; this dual approach allows for the best quality of service, while maximizing efficiency during the patient’s time under anesthesia. Our surgery center and medical team have been in business for over 8 years. The leader of the medical team, a certified anesthesiologist will regulate your child’s safe, peaceful sleep during the entire procedure. Fully trained pediatric nurses work with an anesthesiologist and will be with your child from start to finish. All of our dentists are pediatric specialists certified by the American Academy of Pediatric Dentistry and are ready to care for your child. Our dental assistants round out the dental team and ensure a more efcient procedure by aiding the dentist during surgery. 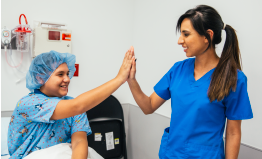 We want to make sure your child’s surgical procedure is a pleasant experience. We specialize in working with kids while employing all the latest practices to make our services more effective. You have peace of mind knowing we are accredited by the AAAHC as an Ambulatory Surgical Center. We always send patients back to their general dentist for routine follow-up care.